Thanks to Mel Brown for the photos and commentary on this episode. 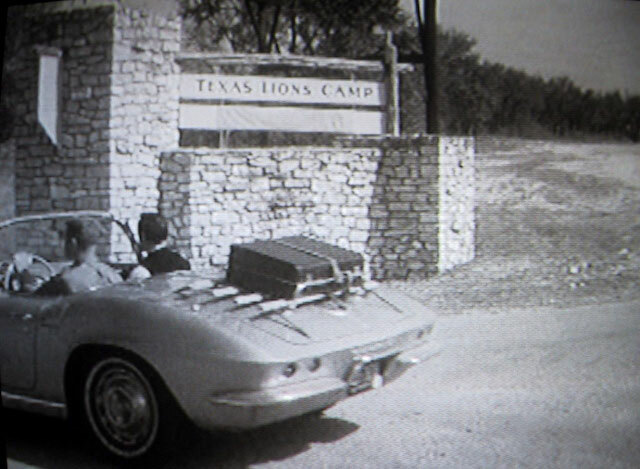 This January I finally made the drive to Kerrville, in the heart of the Texas Hill Country, to visit the Texas Lions Camp for Crippled Children site of filming for the Route 66 episode titled "Even Stones Have Eyes". Now known simply as Texas Lions Camp, it opened in 1952 and provides residential summer camping facilities for children ages 7-16 with physical disabilities, type 1 diabetes and cancer. At the time that the recently blinded Buz received training there, the camp also functioned as a training site for adults with vision impairment issues. This training was discontinued in 1984 and since then the Camp has offered its facilities for children only. They are cared for, managed and supervised by a large staff or medical professionals, therapists, teachers and volunteers who all contribute to an exceptional summer camp experience for children historically denied these pleasures were it not for sites like the Lion Camp. 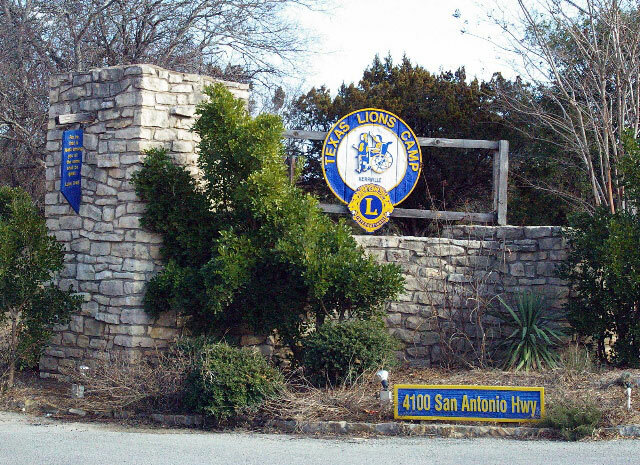 As a Baby Boomer polio victim myself, growing up in nearby San Antonio, I wish my folks had known about this place when I was a partially disabled child. Sitting on over 500 acres of former Hill Country ranch lands, the Camp fronts the Guadalupe River just south of Kerrville, Texas about 130 miles west of the state capital at Austin. My visit there was made more enjoyable thanks to the Camp's Development Coordinator Trish Wilson who guided me to each of the episode filming sites. I then shot the fotos that Rick has posted here along with a screen capture from the episode for comparison. Everything seen in the episode is still at Lions Camp while the facility itself has grown considerably in the past 47 years since Buz visited. By chance my visit was made within a couple weeks of the same time of year as the production company's visit there. 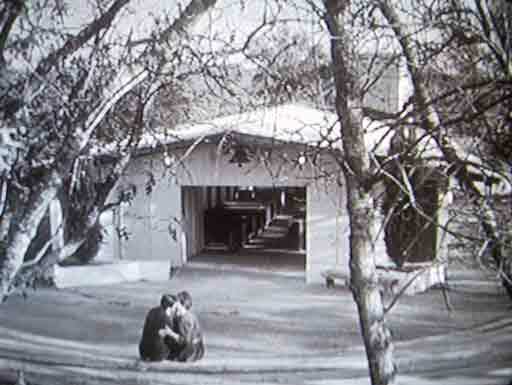 Even though nobody currently working at the Camp was present for the show's filming in 1962, the modern staff was excited to learn of this unique bit of history for their now very well known facility. After we found and photographed the various locations posted here, Trish showed me the Camp's modest museum. 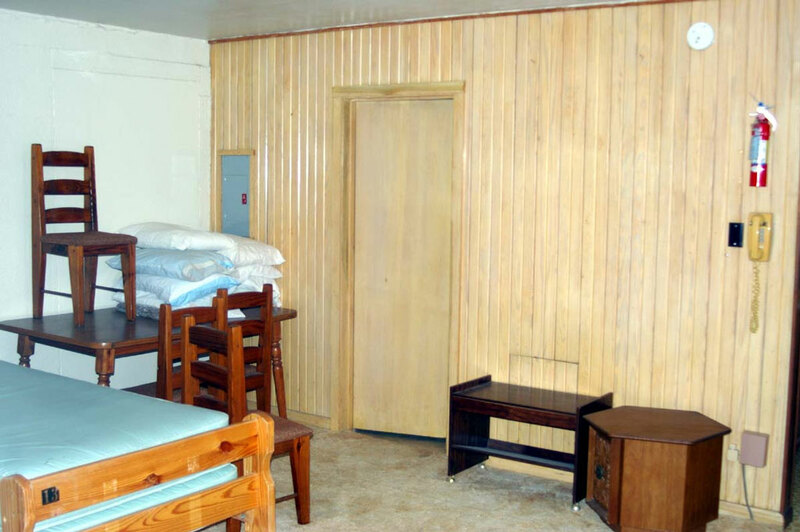 This large room contains a number of items associated with the Camp's successful past efforts and many photographs documenting the staff, campers, and activities experienced there over the last 57 years. A couple of the images caught on film show a wedding held in the open air Chapel seen in the episode. The bride in those fotos was one of the staff who met Buz in the Administration office upon his arrival. 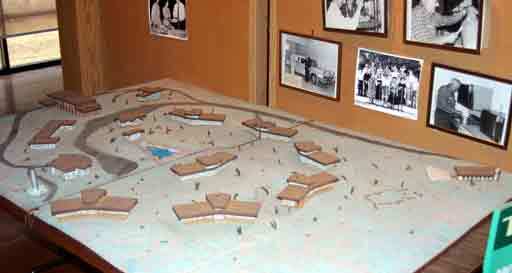 Of most interest in the museum to me and anyone who has viewed this episode is the old 3-D model/map of the camp that was used to help new sightless arrivals learn the camp's physical layout. As seen in my snap shot, it has changed somewhat since Buz felt it because of the addition of several other structures and features to the Camp. Thanks again to Trish Wilson, Diane Sanchez and Texas Lion Camp Executive Director Stephen Mabry for their gracious welcome and generosity in allowing me the privilege of touring the fine facility on behalf of those many members of the Route 66 Message Board. 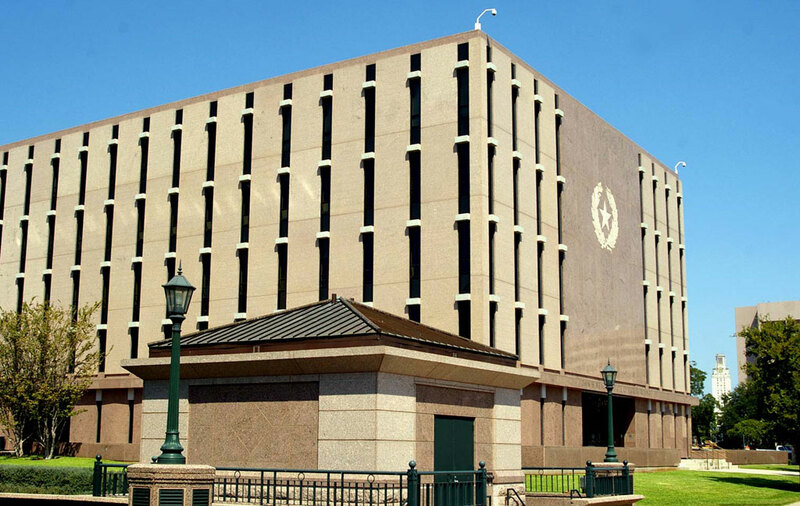 The John H. Reagan State Office Building which was under construction when "Even Stones Have Eyes" was filmed here, in part. This was the first of what has become way too many such sites for various governmental meddling that huddle around the old pink granite Capitol. It was erected in 1962 and Buz was on top when he got his lights knocked out as you'll recall. It is the only thing to show of the week's filming heresince the other locations area all gone now. 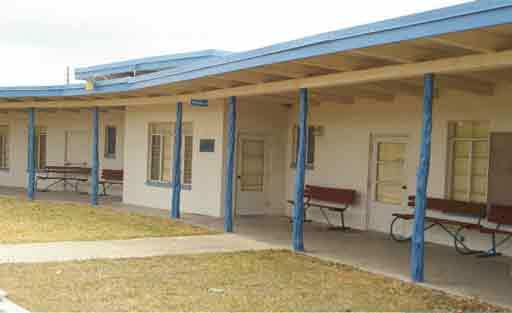 That includes the old Brackenridge Hospital building that was brought down in the mid 1980s then replaced by a more modern facility of the same name. An unaware Buz (stunt double brother George) is about to be knocked off his feet by a load of swinging pipe which blinds him. 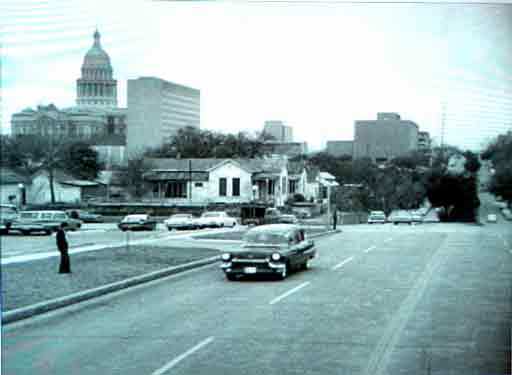 This shot of the Austin skyline as of early 1962 is now most remarkable for its northward unobscured look toward the peaceful University of Texas campus as viewed from the state Capitol complex. 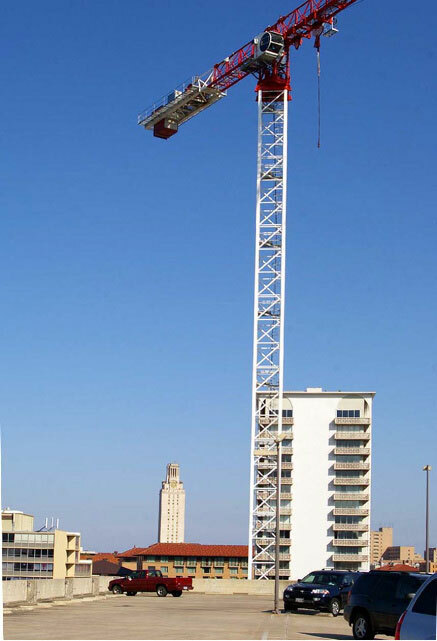 The only structure to be seen then was the UT Tower which, a mere four years hence, would be made infamous for its use by a mentally unhinged sniper as the '60s continued to see America sliding toward an abyss. What followed was race riot violence, burning cities, disruptive Vietnam War protests, and three political assassinations that all rocked America to its core. In 1962 all was still relatively calm and the Tower was UT's main undergraduate library atop which was an observation deck. 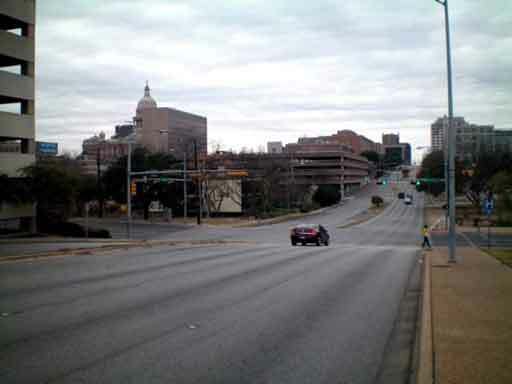 It offered grand views of campus, Austin and a then mostly unobstructed 360 degree panorama of the horizon. From nearly the same vantage point today the Tower is seen still standing tall and still offering an open but now rigidly guarded observation deck. Curiously, the Tower's observation deck was reopened less than a year after the Whitman sniper event but closed permanently eight years later when a distraught student jumped over the chest high wall. After nearly three decades of protests and petitions, the Regents finally consented to reopening it with conditions. A metal fence was placed atop the surrounding balcony walls, guards monitor the elevator at both ends, tickets must be purchased in advance and guides are required for all visitors allowed up and only in groups. It's still worth the trip especially at night. The ambulance carrying a blinded Buz is seen racing eastward up 15th Street toward the Brackenridge Hospital Emergency Room. 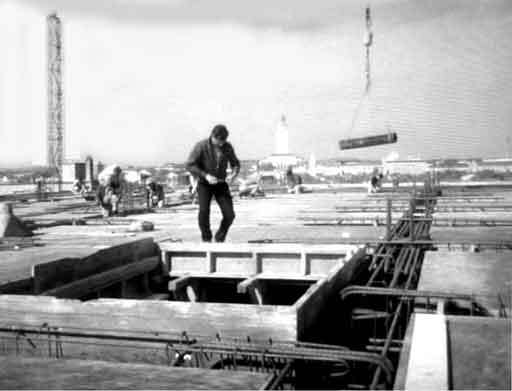 In the upper right background is the top corner of the building with crane where he was injured. An irony that can be mentioned here is that four years later, the guy driving the ambulance was riding in the back, having been shot by Charles Whitman, the UT Tower sniper. He was attempting to gather some of those already wounded when Whitman's scope found him. I once interviewed the gentleman who was then managing the funeral home that owned the ambulances he drove in the 1960s, years before Austin took over emergency services as a municipal function. He had recently come from a gun collectors auction where he was unsuccessful at buying the rifle that had wounded him in 1966. 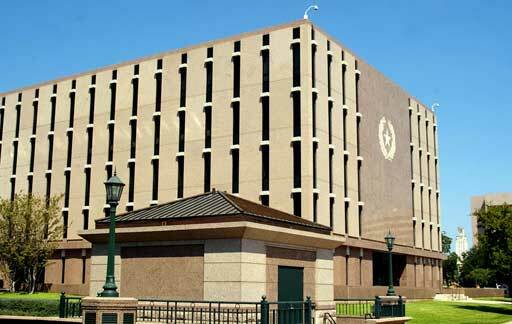 Almost the same vantage point today presents a view changed by the addition of more state office buildings built over the past forty-seven years. The parking garage directly to the left is part of the modern Brackenridge Hospital complex that now covers two city blocks. 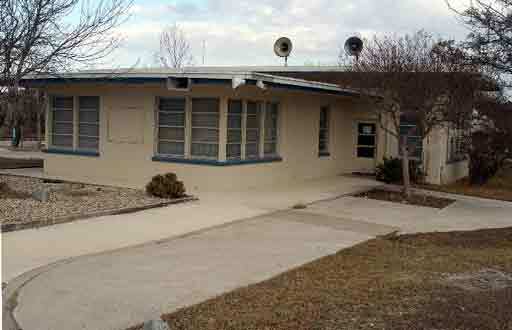 Located at 1804 Lavaca St, one block south of the University of Texas campus, it is now known as the Peach Tree Apartments. It has doubled in size since Buz got his lights knocked out with a second two story addition added on behind. Notice the concrete steps and porch and cut rock curb as both features are plain in the episode. 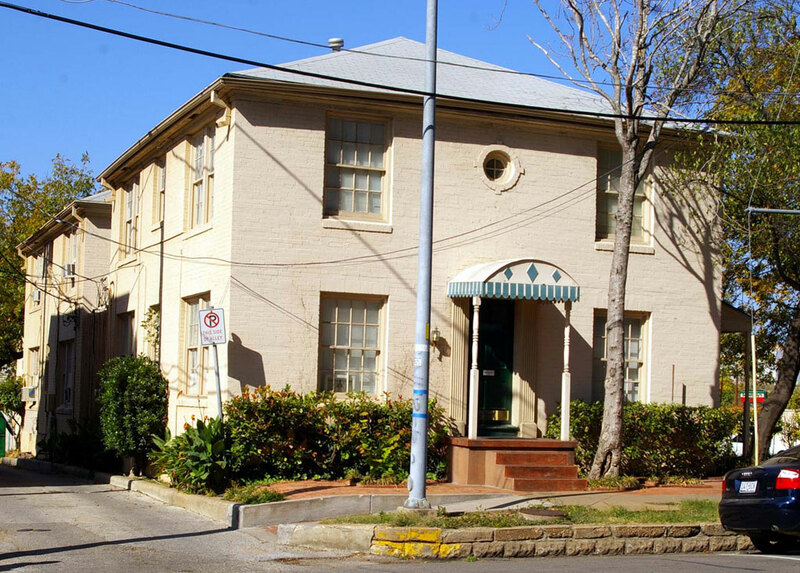 The small awning covers an elliptical feature on the house's facade above the front door. It is also now nearly surrounded by larger buildings, a high rise, upscale tower right across the street that casts its shadow on the older house until mid-day. 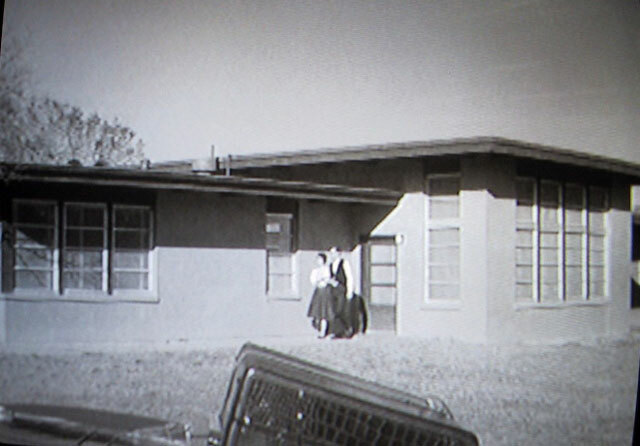 Tod and Buz arrive at the Texas Lions Camp for Crippled Children after the accident in Austin that left Buz blinded. Close scrutiny shows that the lower half of the original sign was temporarily covered by paper as it then said For Crippled Children on its lower half. 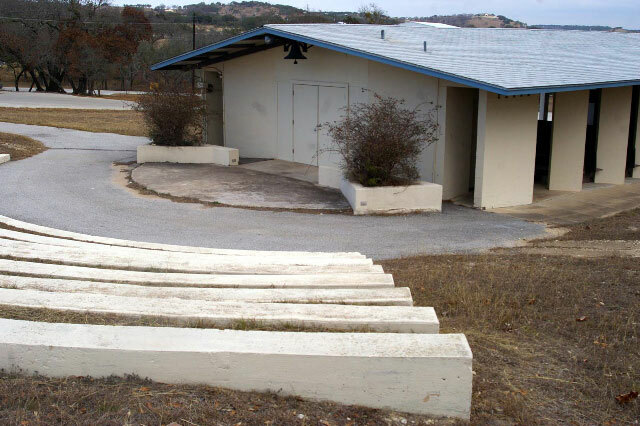 The same native limestone entryway that Tod drove past still stands just off the old San Antonio highway that leads into Kerrville, Texas a few miles away. The old wooden frame that held the original signs is still in place but now holding the Camp and Lions Club shields. Mountain Laurel and Yucca plants grace the entrance now and are lighted at nite as are nearby twin flag poles. Inside the old Administration building is where Buz initially met the staffers who would be working with him. Apparently each of these individuals were, at the time, actual staff members of the Lions Camp's then functional Blind Training Program which began there in 1959. 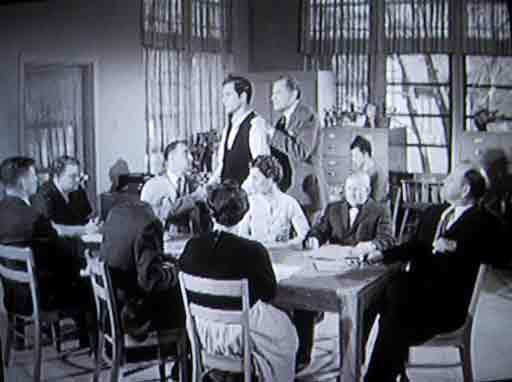 The names we hear when watching this scene were the real names of those people as introduced by the actor portraying the coordinator character Frank Tripp. An administrative secretary can be seen working in the background as Buz is introduced to his new instructors. 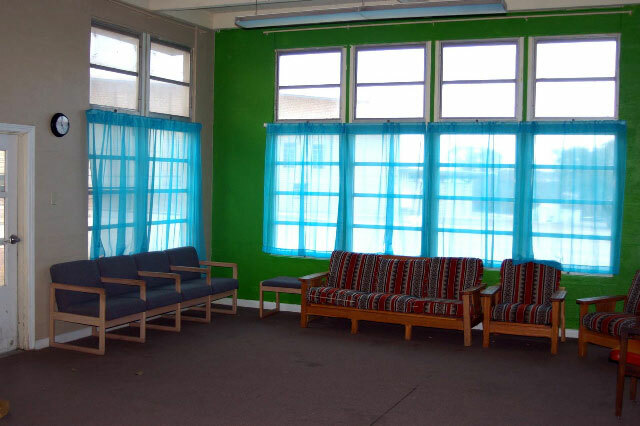 Today that room is used as an area for lounging and visiting with friends in between the many scheduled activities offered to campers now. Otherwise it has changed very little except that all administrative functions are now carried on in a large modern building that is the first structure seen when entering the campus grounds. This shot shows Celia and Buz leaving the Administration offices where he has just met the staff who will work with him. Here is a modern view of the same building which is now no longer an administration site but still houses classrooms as it did during the episode's visit. Because the Camp fills up with several hundred children and workers each summer now, loudspeakers have been installed atop the building that were not present in 1962. This open air Chapel and Amphitheater are visible in a few scenes in the episode as here when the newly smitten young lovers share their first kiss. The unusual site has changed nearly not at all since 1962 except that the small trees behind the outdoor seating are gone now. One difference visible in the two views above is that the Chapel's bi-fold doors were closed during my visit there last week. 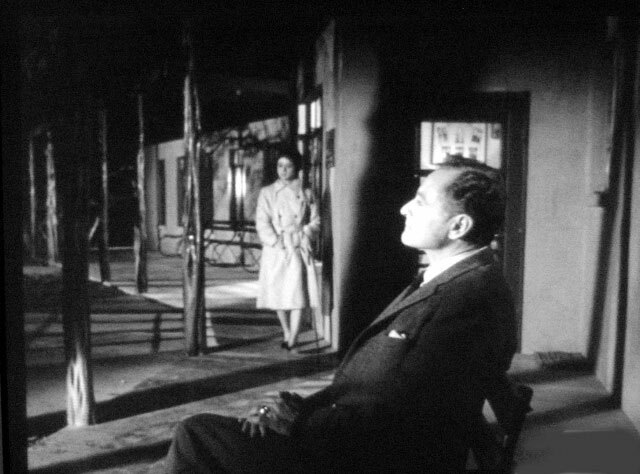 Celia's nighttime chat with Frank Tripp was filmed outdoors on the dormitory porch in late January so we'll assume that the temperature was moderate that particular evening. Those benches still provide seating for friends outside each of the several identical dorms on campus. The only apparent change in this location is that the once naturally stained cedar posts supporting the roof have been painted blue to match the overhang's fascia boards. Buz's dorm room as shared with Chet Hollis was at the time most likely the actual room of one of the Camp's blind trainees as of 1962. Made homey back then with easy chair, and stereo, etc. those clients were indeed residents of the camp for more than a few days to a week like the summertime camp kids were then and are now. My guide at the TLC Trish Wilson showed me inside an average dorm room since they are all nearly identical according to her. 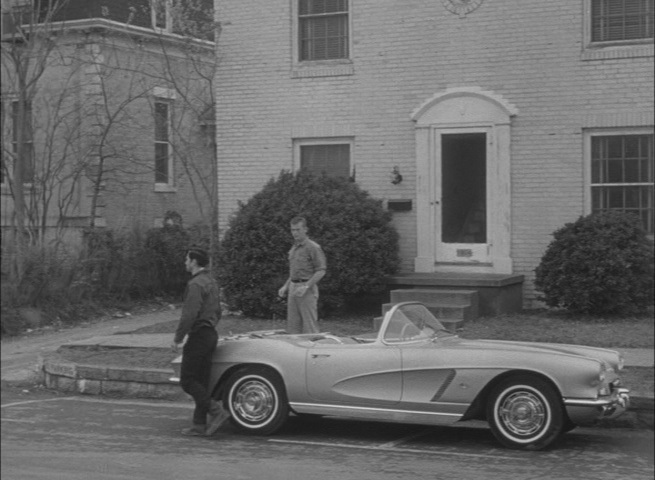 The one I saw seen here resembles the one we see Buz in with what appears to be the same paneling and door. 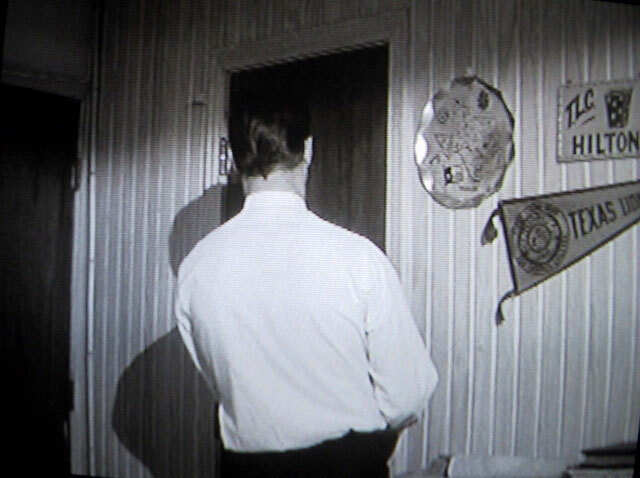 A significant difference is that in the modern view, it's apparent that since Buz's stay, central air conditioning was installed, a breaker panel added and ceilings lowered; also, the door to his left in the screen shot has been painted white. Buz and Celia have decided to go for a walk instead of studying the Lions Camp scale model set up in the large Rec Hall. It was a real treat to find the old Lions Camp scale model still there and little changed as it shows the original campus as of 1962. The museum's wall held many fotos shot at the camp over the years and a few caught my eye. Not visible in this shot were a pair of snapshots of a wedding that took place in the Chapel. Trish pointed out to me that the bride was one of the blind staffers whom Buz was introduced to inside the Administration office. 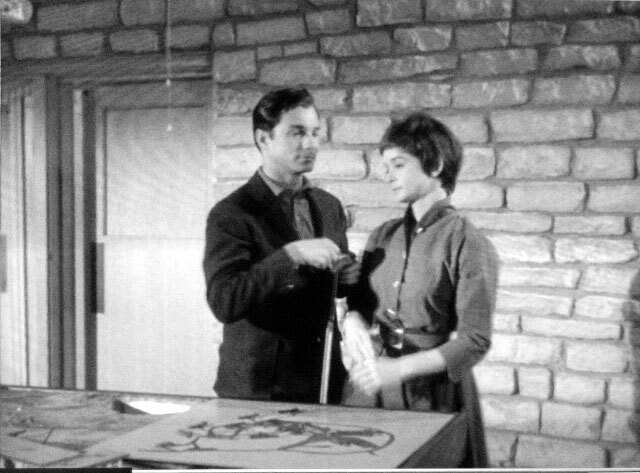 She and another of the blind instructors, who was not featured in that scene, were married shortly after the film production crew visited the Lions Camp. The picture just above the mid-point of the model shows a new 1957 Chevrolet Station Wagon being presented to the then director of the camp. I mention this foto as a possible clue, albeit a slim one, of how Rt. 66 came to be at the Texas Lions Camp which is something I'll always wonder about. My guess is that the local Chevy dealer became aware of the episode somehow and let it be known to Bert Leonard that the TLC was available for filming. I've always wondered about this because the main campus for the Texas School For the Blind was then as it has been since its beginning and still is located in Austin. Considering that the TV production company was already here to shoot the opening scenes, it has bothered me for years that they then packed up their complex movable circus and moved 130 miles west into the hinterlands of the Texas Hill Country to complete the story. That move is mentioned in one of the articles I submitted, that Rick transcribed for these pages, but no explanation for the move was offered therein.